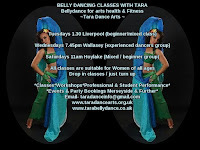 Wirral classes will be running again in 2020. Liverpool class at Whisc will run until the end of march 2019. Tara will taking a break to have her baby until 2020. Please check back at a later date to be updated on alternative classes / workshops run by other great teachers. Level - Experienced improver to advanced levels. Some experience preferred. Style - All / Higher level technique, Props, Choreographed dance routines, Rehearsal. Performance opportunities for those who want to. When - every week. Just turn up! Price - £5 per class. Style - All / beginner / improver dance technique. Follow me dance routines, Fitness, fun, social. Props. Start Date 2019 - New class term resumes in the new year on Saturday 12th January 11am 2019. Session - Drop in / just turn up! When - Every week until March just turn up! Venue - The Parade Community Centre Hoylake. When - Every week. By invite only! Last class this year - 24th November 2018. NEW 2019 Monthly workshops for intermediates.